A controversial statue unveiled by the Satanic Temple at a secret ceremony in Detroit has attracted protests. But who is the goat-headed figure? And what do the elements of the statue symbolise? 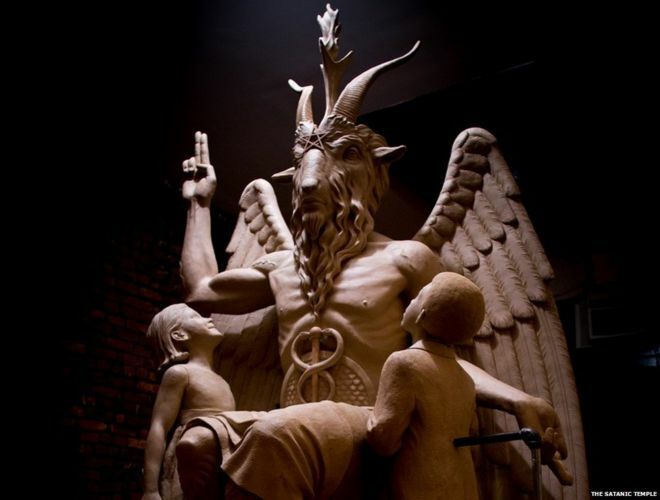 The bronze statue is nearly 9ft tall and depicts a winged hermaphrodite known as Baphomet, flanked by two smiling children. It cost $100,000 (£64,000) to make and hundreds of Satanists turned out to see it unveiled. Long term, the Satanic Temple wants to move the piece 900 miles (1,450km) south-west and erect it opposite a Ten Commandments monument outside Oklahoma City’s Capitol Building. The Baphomet will “complement and contrast” the Christian commandments which include “unconstitutional prohibitions against free speech and free exercise of religion,” according to the organisation. “Our statue will serve as a beacon calling for compassion and empathy among all living creatures,” says Lucien Greaves, the group’s co-founder. Is there any doubt that our country has broken its trust in the Lord? Absolutely, this is the end of Detroit and any city that would put such evil trash on display and claim its religious in nature. this is pure idolatry, Moloch and Balam worship. Our nation is toast and our leaders have legalized such idols and they will pay first with there lives when it comes upon this nation. Ezekiel 14: 12, And the word of the Lord came to me saying when a Land sins against me by acting faithlessly, and I will stretch out my hand against it, and break its staff of bread and send famine upon it, and cut off from it man and beast.